True Organics® Cherry / 90 tabs - Nature's Way®. Why use a cherry fruit extract? Why take True Organics® Cherry? Free radicals are a fact of life - foods we eat, air we breathe, the very act of being alive creates conditions for cellular damage. 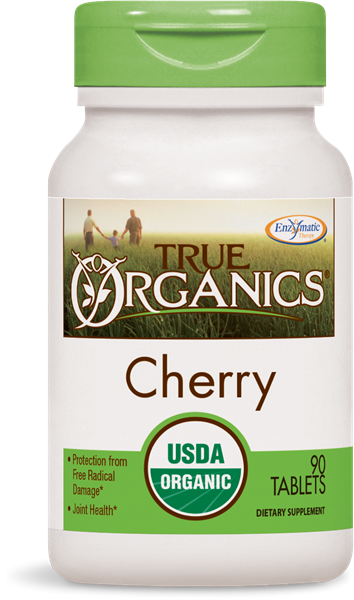 In just two convenient tablets, True Organics Cherry provides the earth-friendly protection from free radical damage you need. * It's made from organically-grown cherries, freeze-dried for a premium product that's superior to lesser quality, drum-dried extracts. Look for the seal on any label of an organic product, any product. If you see the USDA organic seal, you know it's real! But don't stop there. True Organics Cherry is manufactured in a facility that has been certified by Quality Assurance International - a USDA accredited certifying agency. It's the right choice for you, your family and your planet. Take 2 tablets one to three times daily. If pregnant, nursing or taking any medications, consult a healthcare professional before use.